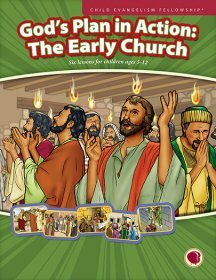 Introduce children to the exciting narratives found in the Acts of the apostles! 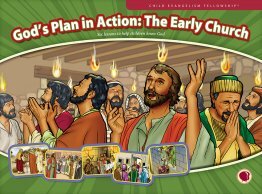 In God’s Plan in Action: The Early Church, Children will learn about God’s protection and provision in the days following Christ’s resurrection along with basic apologetics of why we believe Jesus rose from the dead. They will learn about the Holy Spirit’s work in the lives of believers, how they can stand strong in the midst of persecution and more. 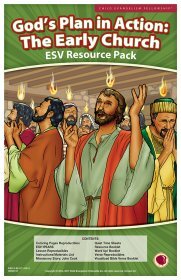 Full-color flashcard visuals to teach six lessons on the early church. Lesson text for six lessons on the early church. 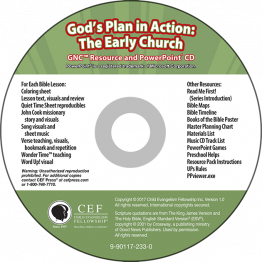 11" x 17" full-color resources: memory verse visuals, Word-Up (main truth of the lesson), resource booklet (review games and activities), UPS Rules, mission story on John and Lois Cook. 8 1/2" x 11" back/white lesson reproducibles: coloring sheets, memory verse bookmarks, Quiet Time sheets, Gospel Spotlights, interactive and review games, growth activities, Wonder Time. PPT visuals include flashcard visuals for Bible lesson and mission lesson on John Cook (Koo Yohan). 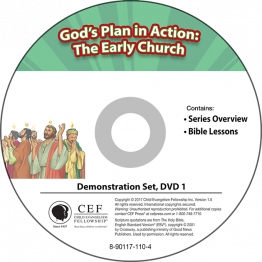 Disc 1: Series Overview and complete Bible lesson demonstrations. Disc 2: Full demonstrations of all songs suggested in the series: God Wants to Spend Time with Just You, His Name Is Jesus, Stop and Go, Trinity Song, 1 Corinthians 15:3-4 (According to the Scriptures), Romans 5:8 (God Shows His Love), John 14:17 (Peace I Leave with You). 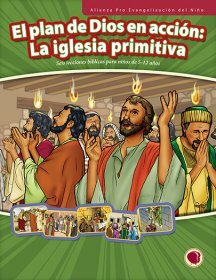 Spanish teacher text for six lessons on the early church. Text includes lesson outlines, detailed story line, review questions, reproducibles and more. 11" x 17" full-color resources: memory verse visuals, Word-Up (main truth of the lesson), resource booklet (review games and activities), UPS Rules, mission story on John and Lois Cook (with English text).